Aiming to help and support local businesses become future-ready, Epson recently held the "Epson Solutions & Technology Convention 2017," a one-day event that showcased the brand's winning products and solutions. 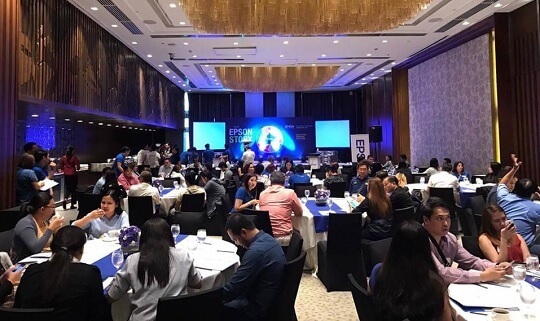 Held at the Marco Polo Ortigas Manila, the convention exhibited Epson's intelligent and innovative solutions including those for print, projection, label and smart glasses that will strengthen Philippine businesses in facing the challenges of the future. Through the integration of self-service, augmented reality, interactive projection and other technologies, local businesses will be able to become competitive despite economic uncertainties, controlled labor market conditions, and increased foreign competition. A guided Solutions Tour featured Epson's various solutions and applications for every business department, including Customer Service, Marketing, Training, Finance and Logistics and Warehouse. Some of the products unveiled are the Moverio smart glasses in the Customer Service booth, as well as Epson’s interactive projectors and large format printers in the Training Department and Marketing Department booths. Ed Bonoan, Senior General Manager and Head of Marketing of Epson Philippines, hopes that through the Epson Solutions & Technology Convention 2017 and other projects for the corporate segment, there will be a strong integration of technology in businesses in the Philippines.